The fifth edition of BFREE’s annual magazine is now available in an interactive format online at Issuu! Get the latest news from the field station and learn about exciting research, conservation and education projects taking place in and around the rainforests of Belize. 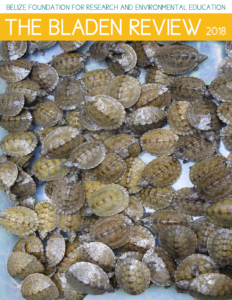 Highlights of the 2018 magazine include: a quick look back at the year, updates on the conservation and outreach programs associated with cacao agroforestry and the Hicatee turtle, and stories from new staff. Also, learn more about the unique eco-tour opportunities scheduled for 2019. Click here to download a PDF of The Bladen Review 2018.